What did we discover after smashing a rocket into the Moon? It's been a year since the LCROSS rocket blew up some of the Moon for science. What did we learn from the explosion? A lot - including where to find water. Today the journal Science published six research papers about what scientists learned from the debris that was thrown over half a mile above the Moon's surface. The debris was ejected after the LCROSS dive-bombed a shadowy crater called Cabeus near the Moon's south pole. Why bomb the Moon? Well, if you can't fund a mission to land in a crater and start digging, you have to improvise. So the LCROSS rocket made the Moon's regolith (soil) come to us. Once substances from the explosion were floating through space, satellites in the area and instruments back on Earth could get a good look at particles lurking in this freezing, sunless region. Many theorized it would be the ideal place to look for water. Which it turned out to be. Yes, there is water - and lots of it. Anthony Colaprete and colleagues analyzed data from the near-infrared and ultraviolet/visible spectrometers onboard the shepherding spacecraft, and they suggest that about 155 kilograms (342 pounds) of water vapor and water ice were blown out of the darkness of the crater and into the LCROSS field of view. They then estimate that approximately 5.6 percent of the total mass inside Cabeus crater (plus or minus 2.9 percent) could be attributed to water ice alone. So it sounds like if we want to build a lunar colony, we'll need a water mining operation inside Cabeus and possibly many other craters similar to it. 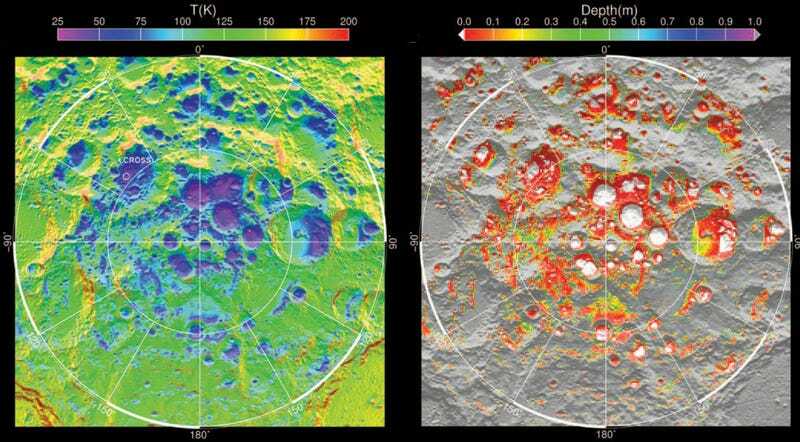 Above, you can see heat and depth maps of the Moon. The image on the left shows how cold the surface area around the LCROSS impact usually is (also note LCROSS impact is marked). On the right is a depth map that shows where scientists believe water ice is likely located based on surface temperature and depth. White areas are places where water ice could be trapped on the surface without sublimating off into space. Colored areas are too warm for ice that's less than 1 meter below the surface. What did we find other than water? Another research report in details how researchers also discovered hydroxyl, carbon monoxide, carbon dioxide, ammonia, free sodium, and even silver. One of the scientists, Peter Schultz, explains how the impact allowed his team to find these compounds once they were ejected far above the Moon's surface. NASA-engineered collision spills new Moon secrets from Brown PAUR on Vimeo. Just how big was this explosion? Researchers say the rocket impact created a crater about 25 to 30 meters wide, and that somewhere between 4,000 kilograms (8,818 pounds) and 6,000 kilograms (13,228 pounds) of debris, dust, and vapor was blown out of the dark crater and into the sunlit LCROSS field of view. Below is an image taken shortly after the impact, showing the debris floating upward into space. Paul Hayne and colleagues describe how they measured the thermal signature of the LCROSS impact with the Diviner Lunar Radiometer onboard the Lunar Reconnaissance Orbiter (LRO). Their observations provide insight into how energy is dissipated and matter is slowly cooled during such planetary impacts. The researchers suggest that, during the LCROSS impact, a region of 30 to 200 square meters of the Cabeus crater's floor was heated from approximately 40 degrees Kelvin to at least 950 degrees Kelvin-and that the residual heat was enough to sublimate about 300 kilograms (661 pounds) of water ice in four minutes after the impact. Here's an image taken by the LRO that shows the heat signature of the region 90 seconds after impact. The pullout box shows the teeny ultra-hot dot where the impact took place. The blast basically evaporated 661 pounds of water ice. So what's next? Certainly this is good news in terms of setting up a permanent human base on the Moon. There's a local source of water. And there's still a lot more research to be done - not just about the Moon, but about the history of our solar system, whose molecular traces lie fossilized in our satellite's shadows. All sources below are from Science journal.